Web Services (WS) technologies, generally built around the ubiquitous Extensible Markup Language (XML), have provided many opportunities for integrating enterprise applications. However, XML/Simple Object Access Protocol (SOAP), together with Web Services Definition Language (WSDL) and Universal Description Discovery and Integration (UDDI), form a comprehensive suite of WS technologies that have the potential to transcend beyond mere application integration within an organization, and to provide capabilities of integrating processes across multiple organizations. Currently, the WS paradigm is driven through parameters however; the paradigm shift that can result in true collaborative business requires us to consider the business paradigm in terms of policiesprocesses- standards. This chapter, based on experimental research carried out by the authors, demonstrates how the technologies of WS open up the doors to collaborative Enterprise Architecture Integration (EAI) and Service Oriented Architecture (SOA) resulting in Business Integration (BI). 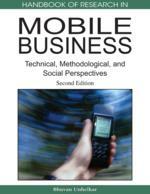 The chapter also provide a quantitative investigation based on organization’s adaptation to mobile and Web Services technologies. This chapter describes how WS can be used in order to align and integrate business processes of organizations (internal and external processes) to satisfy the needs of Enterprise Architecture (EA). Thus far, the concept of Business Integration (BI) has been mainly focused on integrating the business processes internal to an organization; however this chapter is an investigation to identify how the organizations can extend this integration with those business processes belonging to other enterprises and how they adapt mobile and Web Services technologies in order to integrate with those business processes. According to Finkelsteing (2006) Enterprise Architecture (EA) builds on business knowledge and allows business specialist experts to apply their respective knowledge to determine the most effective technology and process solutions for the business. Information and Communication Technology (ICT) architectures have not paid enough attention to integration of the services in the past. Service Oriented Architecture (SOA) is an architecture that makes the services of a system to interact and perform a task supporting a request. SOA is classified as sub-architecture of Enterprise Architecture. Based on Barry (2003), a Service Oriented Architecture (SOA) is a part of an EA and can be viewed as “sub-architecture” of an Enterprise Architecture. SOA existed before the advent of Web Services. Technologies such as Common Object Request Broker (CORBA) and Distributed Component Object Model (DCOM) afforded the opportunity to create SOA. Web Services is ideal technology for developing sophisticated architecture. The Open Group Architecture Framework (TOGAF) is a critical architecture for the effective and safe construction of business and information systems. TOGAF provides the TOGAF Architecture Development Method (ADM). TOGAF ADM is a comprehensive, detailed, industry standard method for developing Enterprise Architectures Integration (EAI), and related information, application, and technology architectures that address the needs of business, technology, and data systems (http://www.integrationconsortium.org). Preliminary phase: Framework and principles. Get everyone on board with the plan. Phase A: Architecture vision. Define your scope and vision and map your overall strategy. Phase B: Business architecture. Describe your current and target business architectures and determine the gap between them. Phase C: Information system architectures. Develop target architectures for your data and applications. Phase D: Technology architecture. Create the overall target architecture that you will implement in future phases. Phase E: Opportunities and solutions. Develop the overall strategy, determining what you will buy, build or reuse, and how you will implement the architecture described in phase D.
Phase F: Migration planning. Prioritize projects and develop the migration plan. Phase G: Implementation governance. Determine how you will provide oversight to the implementation. Phase H: Architecture change management. Monitor the running system for necessary changes and determine whether to start a new cycle, looping back to the preliminary phase.